Features of Linotetranus amiculus, from Meyer & Ueckermann (1997). Contains: Tetranychinae, Bryobiinae, Tenuipalpidae, Tuckerella. The Tetranychoidea is a group of small plant-feeding mites, including the spider mites (Tetranychidae) and related tax. Members of this group are characterised by the modification of the chelicerae into elongate, retractable stylets that form a single hollow tube when protruded, allowing the mite to penetrate the outer cortex of its host plant. Some species of tetranychoids are significant crop pests. The spider mites of the Tetranychidae receive their vernacular name from their production of silk webbing from unicellular glands on the palpi. The small family groups Linotetranidae and Allochaetophora include relatively slender mites associated with the crowns and roots of grasses and sedges. Species of Allochaetophora have three pairs of setae on the prodorsum and two pairs of eyes; Linotetranidae have four pairs of setae on the prodorsum and lack eyes (Walter et al. 2009). 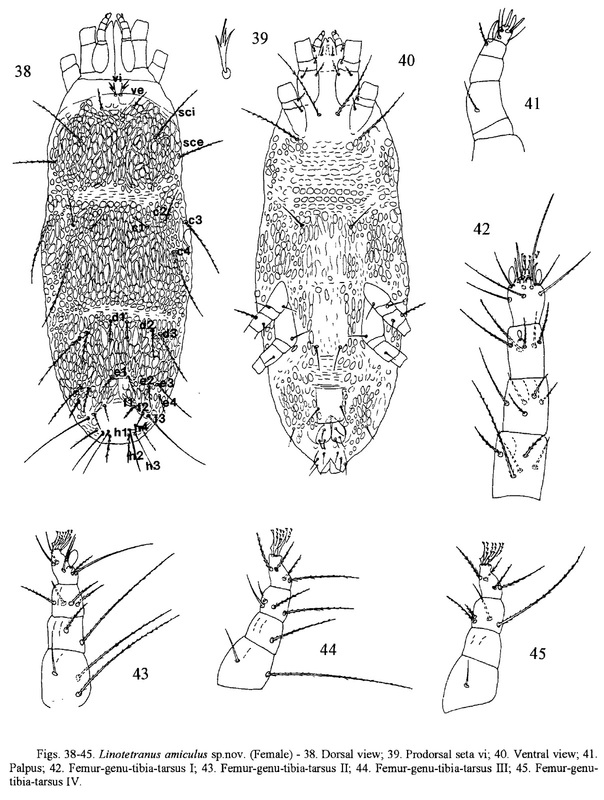 Within Linotetranidae, the South African species Anoplopalpus inunguis has a reduced palpal setation with three phaneres (two eupathidia and one seta) on the palptarsus and no claw on the palptibia (Meyer & Ueckermann 1997). 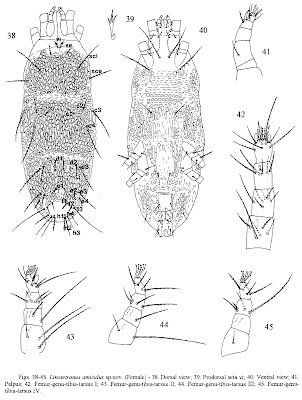 Characters (from Meyer & Ueckermann 1997): Cheliceral bases fused to form a stylophore that is movable independently of the subcapitulum and can be retracted into the prodorsum; movable cheliceral digits styletlike, greatly elongated and strongly recurved basally within the stylophore, thus allowing for a greater degree of retraction and protraction, forming a single hollow probe; a pair of well-developed peritremes are embedded on the anterior portion of the prodorsum, where they end in somewhat protuberant enlargements; true claws of the legs equipped with tenent hairs, or chaetoids; males provided with aedeagal structures for direct sperm transfer. [MU97] Meyer, M. K. P. S., & E. A. Ueckermann. 1997. A review of some species of the families Allochaetophoridae, Linotetranidae and Tuckerellidae (Acari: Tetranychoidea). International Journal of Acarology 23 (2): 67–92. [OA96] Ochoa, R., H. Aguilar, G. Evans & C. Vargas. 1996. Knowledge of phytophagous mites (Prostigmata) of Central America. In: Mitchell, R., D. J. Horn, G. R. Needham & W. C. Welbourn (eds) Acarology IX vol. 1. Proceedings pp. 181–184. Ohio Biological Survey: Columbus (Ohio).